My Samsung Galaxy SII is in the repair shop right now so this is actually my old phone, the Galaxy Ace, which I was using last year. 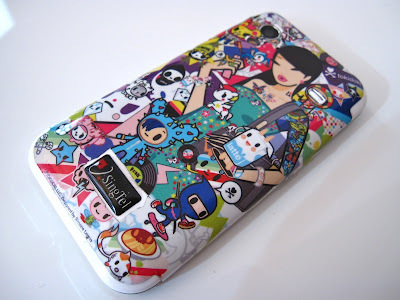 The Tokidoki Gelaskin was designed for an iPhone, hence the messy edges that I cut in it to make it fit the Ace. Only after I cut the hole for the Singtel logo did I realise that the Singtel thingy was a sticker that could be peeled off... *facepalm*. I've been using this Samantha Thavasa Liberty print wallet for over two years now, and it's still in excellent condition. 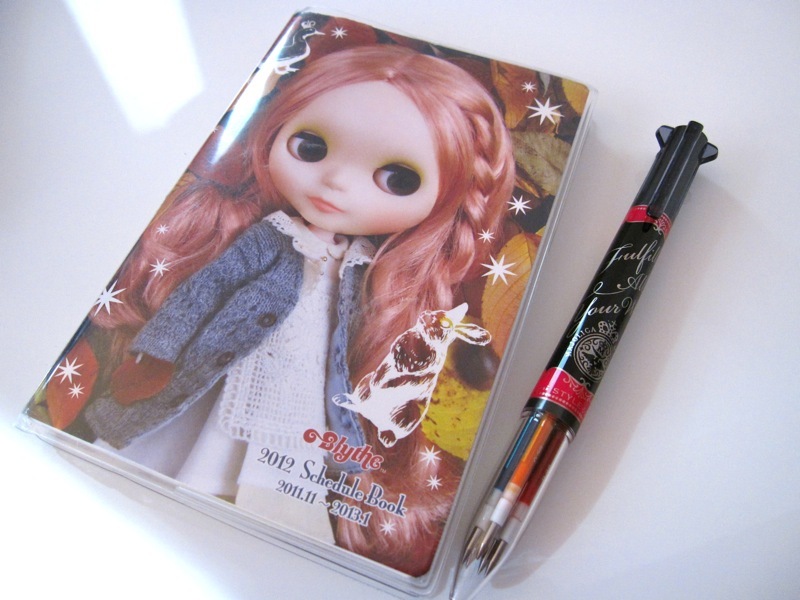 It's the perfect design for me as it has several card slots and does not feel too bulky. 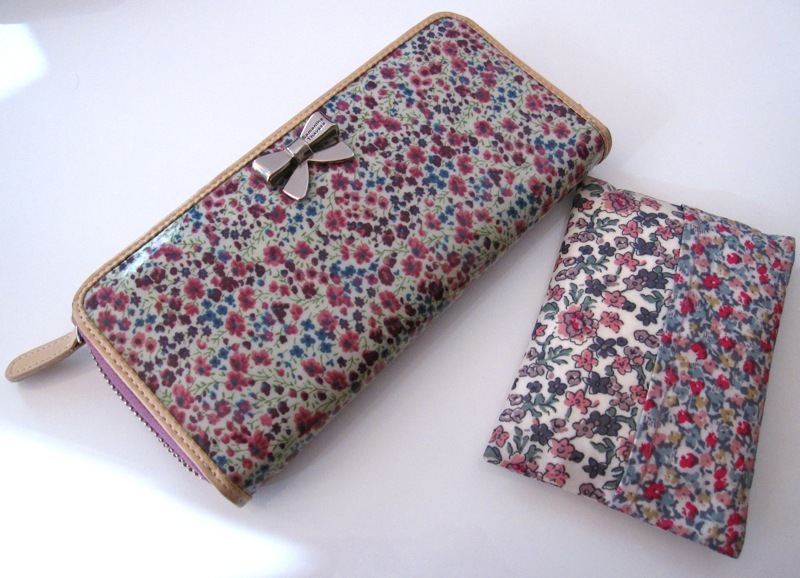 Next to it is a Liberty print tissue case that was a freebie with a Japanese magazine from several months ago. 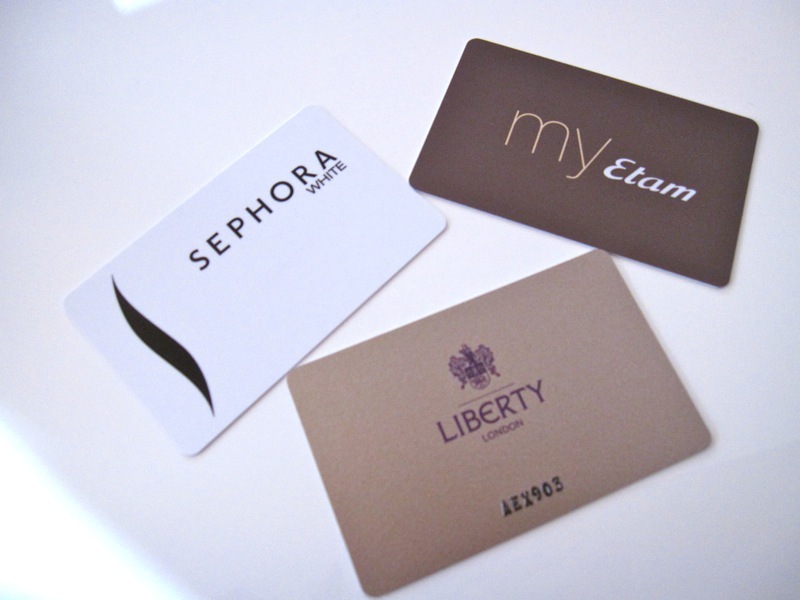 Membership cards for Sephora (France), Etam (a French clothing store) and Liberty in London. I carry mainly lip products for touch-ups on the go in a LeSportsac pouch, together with an Anna Sui compact mirror and my staple Gatsby oil blotters. 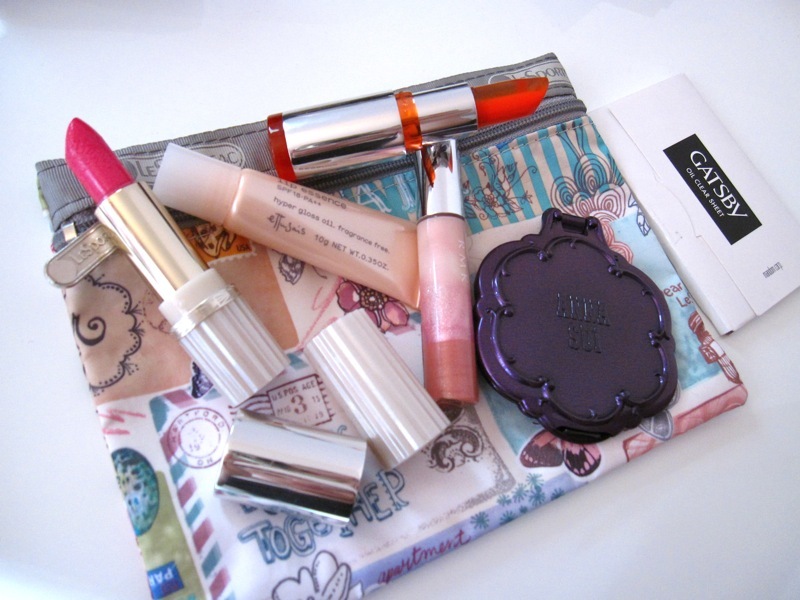 This week, I've been using Paul & Joe Lipstick M 002 (from last fall's Manhattan collection), RMK Mix Colors For Lips 05 Holographic Light Pink, Clarins Crystal Balm 03 Crystal Coral and Ettusais Lip Essence. A Blythe diary for jotting down random lists. A very kind friend also just sent me the limited edition Majolica Majorca pens that were released recently in conjunction with the Psychedelicious collection. I think these are only available in Japan. 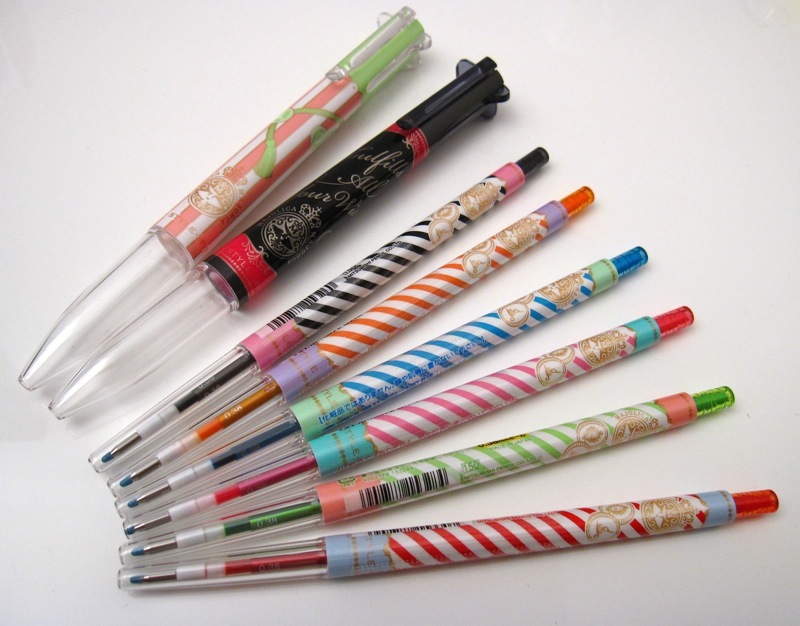 The two fatter pen holders can be filled with five ink refills. If you have a blog, do join in by leaving a comment on Yumeko's post and here with a link to your blog post, and I'll be sure to check it out! i am still trying to figure out how u cut those holes out XD is the case rubber or plastic?? I'm very impressed how the wallet stays in shape. 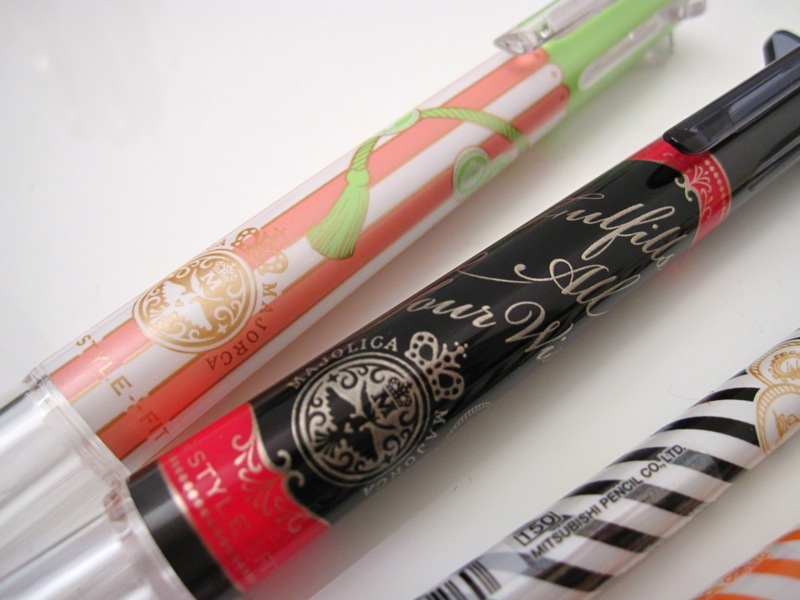 I tried those gatsby sheets recently too and they are one of the best I've used! I buy the Gatsby sheets by the dozen, and always need to have them around to mop up my oil rig! Thank you for sharing! Love your wallet, it's so pretty and in really great condition. 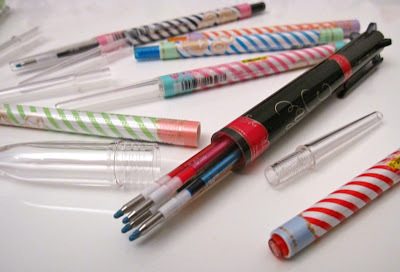 Those pens are great too. I finally had some time so I was able to play and do the meme. I am always looking forward to Friday! Enjoy the Friday Meme series! Your hp cover is very cute! The MM pens are so pretty! This is a very interesting post and I love your wallet!